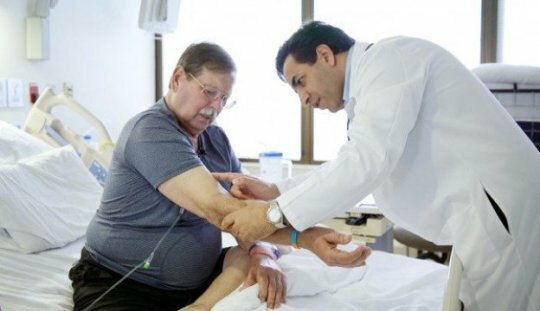 A new type of immunotherapy shows promise against cases of acute myeloid leukemia (AML) that recur after treatment or that never respond to therapy in the first place. A small clinical trial at Washington University School of Medicine in St. Louis provides evidence that the immune system's "natural killer" cells can be dialed up in the laboratory, trained to recall that activation and then effectively unleashed to destroy cancer cells in some patients. "This is a small study, but a 50 percent response rate is promising since these are patients with very poor prognoses and very few options," said senior author Todd A. Fehniger, MD, PhD, co-principal investigator of the study and an associate professor of medicine. "Many of these patients are older and are not candidates for traditional bone marrow transplants because of the side effects associated with such an aggressive treatment." In the new trial, four additional patients received NK cells, but the therapy's effectiveness could not be evaluated in those cases. Three of these patients died of bloodstream infections before the end of the trial, and one patient did not receive a full dose of NK cells because sufficient quantities of the cells could not be obtained from the donor. "We are cautiously optimistic about these results," Fehniger said. "There's so much variability in how an individual patient responds to treatment, but this particular immunotherapy does seem to be inducing remissions in patients for whom other therapies, including similar investigational immune therapies, have a small chance of working." Natural killer cells are a type of immune cell that can recognize and attack tumor cells and cells that have been infected by viruses. In some cases, NK cells have been shown to attack leukemia cells on their own, with no special modifications. But past work by Fehniger and other Washington University researchers has shown that exposing NK cells in the lab to a combination of three chemical signals — called interleukins 12, 15 and 18 — activated them to transform into "cytokine-induced memory-like" NK cells, and therefore become more potent in fighting the leukemia after injection into the patient. "Soldiers are never sent into combat without basic training," said first author Rizwan Romee, MD, co-principal investigator of the study and an assistant professor of medicine. "You can think of the activation period in the laboratory as a sort of boot camp, exposing the cells to some of the conditions and signals they will encounter in the patient's body. So when the NK cells see the real cancer for the first time, they remember their training and respond more effectively than cells that don't have this exposure." For this immune therapy, the NK cells are taken from a donor who is closely related to the patient, usually an adult child, parent or sibling. After separating the donor's NK cells from the rest of the blood, the cells are incubated overnight in a mixture of interleukins 12, 15 and 18. These chemical signals activate the NK cells and "train" them to attack the leukemia cells more effectively when they are encountered in the patient following infusion. To prepare for this NK cell therapy, the patient undergoes chemotherapy to suppress the immune system so that the donor's activated NK cells have the time and space to multiply in the patient's bloodstream and go after the cancer cells. As the patient's immune system recovers, it clears the donor's NK cells from the body, eliminating the possibility of long-term adverse events. "We escalated the dose as the trial went on," Fehniger said. "And we saw remissions at each dose level, even the lowest one. Now that we have established the safety of this immune therapy, we would like to find out how consistently the patients respond when we treat a large number at the highest dose level, which is what we're in the process of doing now." The researchers also pointed out that using this cytokine-based activation approach likely will be combined and investigated with other immunotherapies in efforts to fully unleash the anticancer response of natural killer cells. The researchers also are planning new ways to harness this "memory-like" NK cell therapy in clinical trials, including testing the cells in conjunction with "mini" bone marrow transplants to see if the two strategies together improve response rates. They also are preparing to investigate this immune therapy in pediatric patients whose AML has relapsed. The above post is reprinted from materials provided by Washington University in St. Louis. The original item was written by Julia Evangelou Strait. Note: Content may be edited for style and length.